On the road again? Stuck in the airport? Subjected to the limited choices of convenience store food and over-priced airport food, healthy eating and traveling seems to be an oxymoron. Good news, all is not lost from the healthy eating habits you have created at home. Traveling and eating healthy can happen. But first, let’s back up and talk about what we mean when we say healthy eating at home. Unfortunately, just because a food product contains a label that shouts “organic,” “gluten-free,” or some other type of health claim, doesn’t actually make it nutritious. Often times it’s the ole bait n’ switch. Distract us from what it doesn’t have so we don’t look at what it does have, such as refined carbohydrates and preservatives. The equation for a nutritious diet starts with what you do eat, and ends with what you don’t eat. 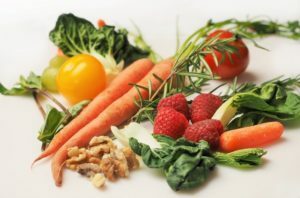 A day full of vegetables (think dark leafy greens, or cruciferous vegetables like kale, broccoli, brussel sprouts, but basically any non-starchy vegetable in general) is a key component of healthy eating. Vegetables are full on nutrients and fiber, which are important for keeping all of our bodily functions operating at full capacity. The other part of this equation is eating quality proteins (such as eggs, fish, beef, chicken,etc.) and choosing complex carbohydrates over simple carbohydrates. This means, for example, choosing to eat plain oats over heavily processed cereals. It’s also important to ensure that you are getting in enough good fat in your diet, without fat your body would not be able to absorb important nutrients like vitamins A, E, D and K. By focusing on these types of foods we are providing our bodies with a source of vitamins, minerals, enzymes and fiber in the form of important macro-nutrients that add up to everything running smoothly. Avoiding, or at least limiting, foods containing ingredients such as processed sugars, refined grains, and preservatives is the other part of the equation, along with drinking alcohol in moderation. That was part one of the healthy eating equation. Part two of the equation is eating mindfully. Eating mindfully has several moving parts. What we often find is that the healthier one eats, the easier it is to listen to one’s body cues and eat accordingly. Hungry? Eat. Not hungry? Don’t eat. However, often times as we are transitioning into a healthier lifestyle we need some tools to help aid us along the way. A few tools to use include; putting your fork down between bites (this helps the hormones in your stomach and your gut have time to catch up to your brain), eating without electronics so you can fully savor and appreciate your food, and always paying attention to how your hunger came about, is your stomach truly empty or did you just watch a food commercial that stimulated your appetite, not your true hunger? So how do we put this together and keep up the momentum of this type of eating while on the road? It all boils down to planning, with a side of planning, then some more planning, and a dash of strategy. The first step is to assume that there will be extremely limited options wherever you go and therefore plan to become self-sufficient. This means packing food to take with you. Foods that travel well include; nuts, apples, individual nut butters, Epic bars, RX bars, hard-boiled eggs, and some other fruits and vegetables, such as celery, carrots, bananas and oranges depending on whether you are traveling in a car or on a plane. You can also buy “healthier” frozen types of foods, such as Amy’s burritos and keep them in a cooler in your car, or if flying, wrap them in a cold/freezer bag and put in luggage. If you can make a pit-stop at a grocery store at your destination that is even better, stock up your hotel room with healthy grocery store booty. Another great way to plan is to bring a powdered form of nutrition, such as a good protein powder and your own shaker cup. Often times you can mix that with water and easily have a fairly nutritious meal or snack. It’s normal for work travel to involve some type of eating out. In which case, you guessed it, plan ahead. The best way to do this is to research the restaurant you will be eating at ahead of time. Know the menu options and pre-determine what you will order before you ever set foot in the door. We know you won’t have access to this information for every restaurant, so some strategies to keep it as healthy as possible include; ordering two salads to make one meal, ask if items on the menu can be modified, order a double or triple side of vegetables in place of fries, skip the bread basket, and always stick with water as your beverage of choice. Water should also be your beverage of choice if driving, and especially if you are flying. Flying really does a doozy to our hydration levels, planes are incredibly dry (an airplane makes the Sahara look like an oasis) and we lose water just through the simple act of breathing. In order to stay healthy we should aim to drink at least 8 oz. of water per hour of being on the plane. 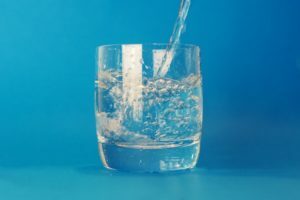 Being dehydrated can lead to a myriad of problems, including decreased mucus membrane linings (therefore reducing immunity), creating feelings of fatigue, impairing memory and reducing overall general cognition. 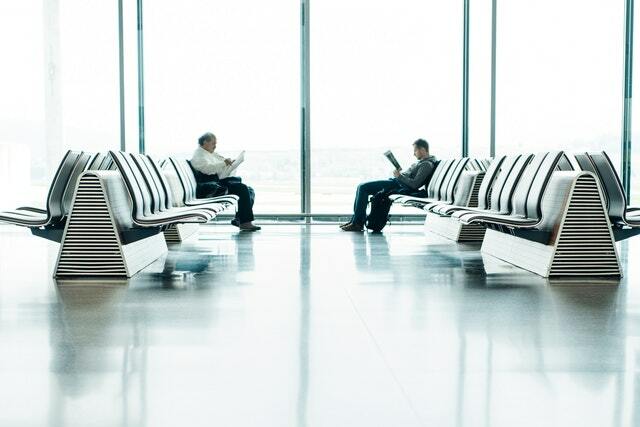 No one wants to feel like that stepping off the plane, so drink water before getting on the plane, while on the plane and after getting off the plane. And lastly, we want to stay as healthy as possible while traveling so keep your gut in check while traveling; time changes, different foods and hydration levels can all wreak havoc on your gut. It’s helpful to pack a good quality probiotic and perhaps an additional source of fiber to keep your system as regular as possible and keep your immune function up as the majority of your immune system is located in the gut. No one said this was going to be easy as America’s SAD (Standard American Diet) has put you behind the eight ball when traveling, but nothing worthwhile ever is. It also isn’t impossible and by a bit of scouting of restaurants and not being afraid (particularly men) of being “weird” by ordering salad instead of fries and some simple planning, it gets easier the more you do it. Just remember no one is perfect. Happy and healthy eating! This entry was posted in Blog, Nutrition & Fitness and tagged healthy eating and traveling. Bookmark the permalink.